Just A Car Guy: Charles Harvey making a test run along the Greenwich Street portion of his cable-driven West Side and Yonkers Patented Railway. December 1867 at the corner of Morris Street and 39 Greenwich Street. 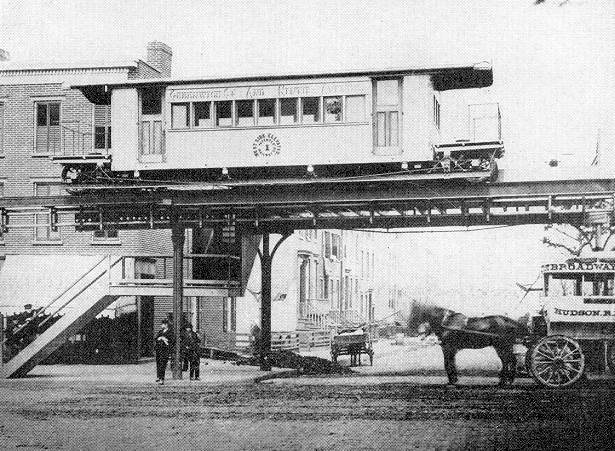 Charles Harvey making a test run along the Greenwich Street portion of his cable-driven West Side and Yonkers Patented Railway. December 1867 at the corner of Morris Street and 39 Greenwich Street. 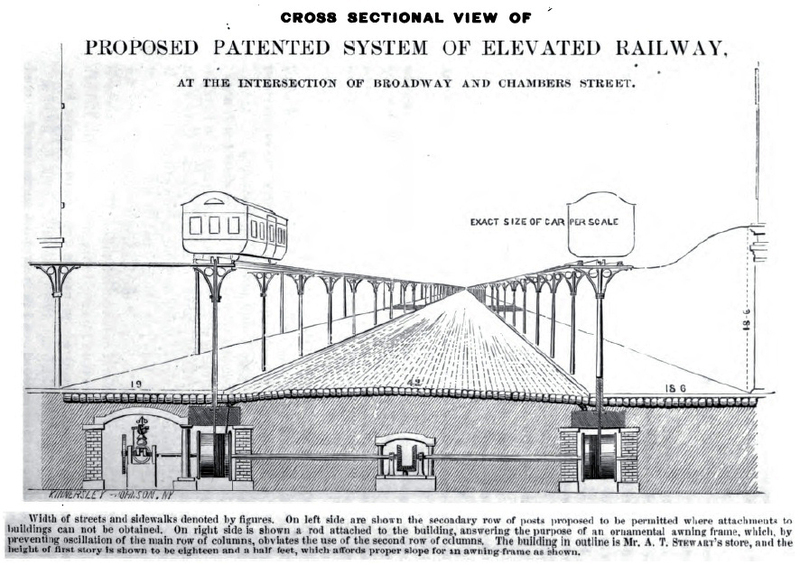 That line ended up becoming the 9th avenue elevated line, which became known for having the worst accident in the history of NYC's elevated lines. 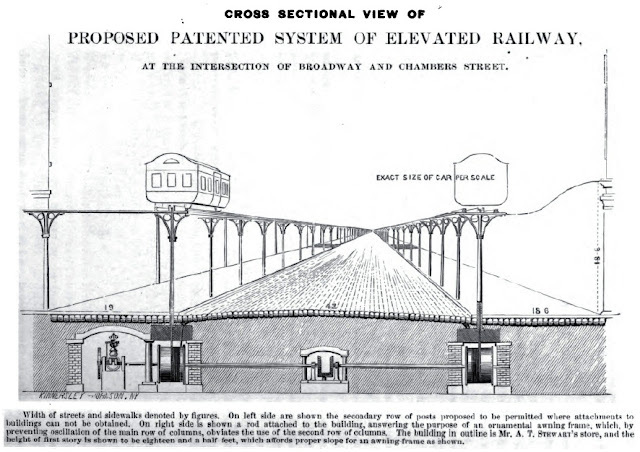 In 1867, Charles T. Harvey (1829-1912), a self-trained civil engineer who had built the Soo Canal uniting Lake Superior and Lake Huron, built an experimental single-track cable-powered elevated railway from the south end of Manhattan Island, northward up to Cortlandt Street. His company had been chartered the year before under the name of the West Side and Yonkers Patent Railway Company, with subscribed capital of $100,000, to build a 25 mile elevated railroad from the southern extremity of the city northward through the city and thence to the village of Yonkers. The half-mile line was dubbed the “one-legged railroad,” because the single track ran above the street on a single row of columns. The cable was a loop, driven by a stationary engine, that ran between the rails for propulsion of the cars, then returned under the street. The system broke down frequently and stopped running some time in 1870. 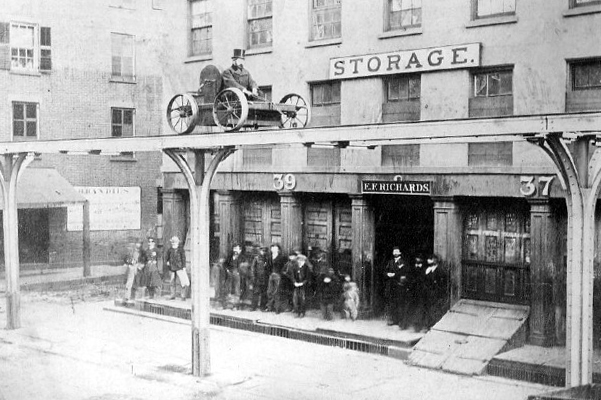 A contemporary magazine article says "The Greenwich Elevated Railway, which at first was a total failure as long as several stationary engines were used, moving the cars by means of a wire rope, has become a decided success since the employment of small locomotives, each pulling two or three quite long cars." Another article describes the technology and its problems in more detail: "...the main trouble by which the first management lost considerable money, (and probably the cause of the breaking of the company financially,) were the costly experimental contrivances intended for the propulsion of the trains. They consisted in an endless wire rope of about a mile long, and of which one-half moved over pulleys between the rails, while the returning half moved through a small tunnel underground, along the base of the columns.